Hello Everyone! Here is another peek at this years Scrap Camp. If you would like to see the first two posts you can go here and here. Two of the gals made these super cute flip flop cookies. 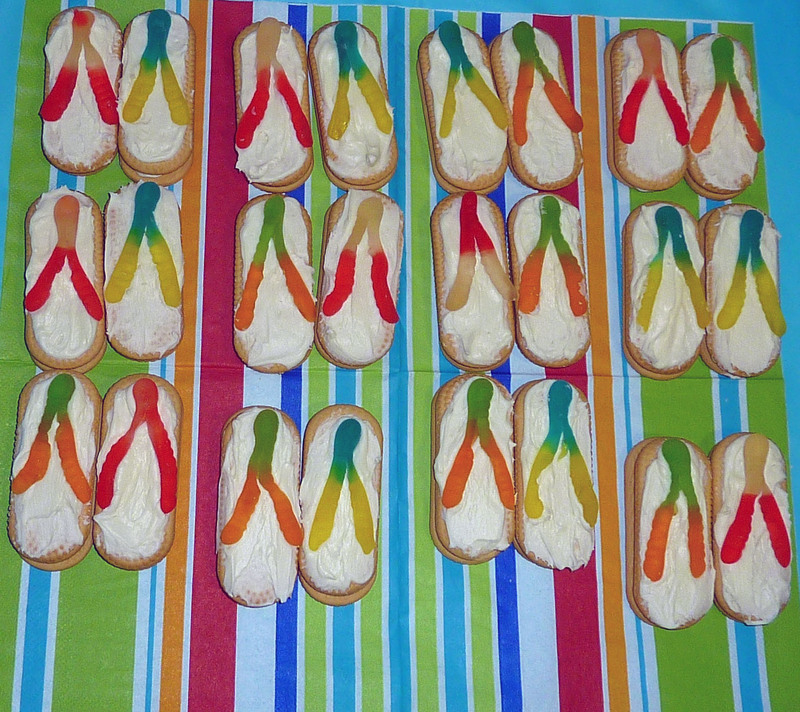 They are made using Vienna Finger cookies, frosting and gummy worms. Too cute, huh? Even cuter because the napkin they used looks like a beach towel. There were rules at Scrap Camp and rule #4 was the most popular one. 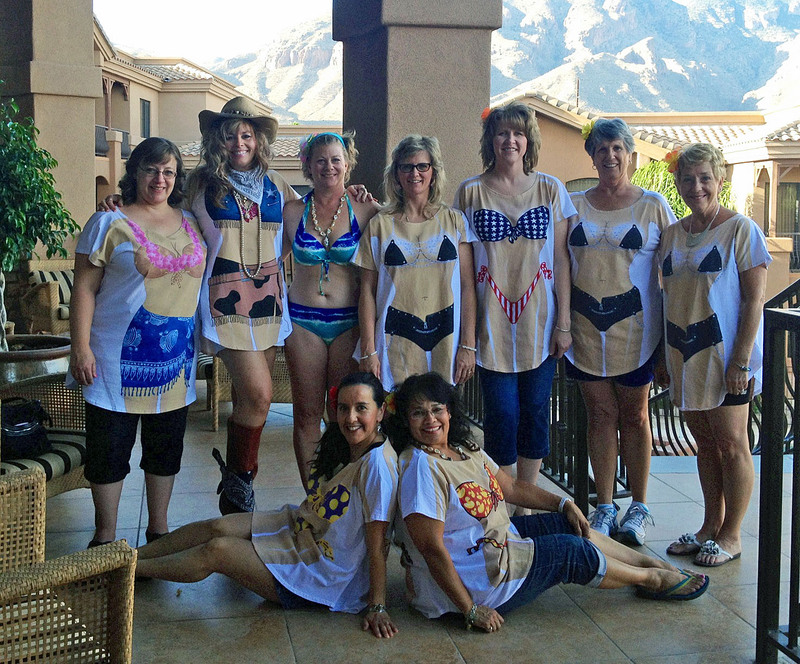 I have to tell you, we had SO much fun with these bikini tee shirts. None of us knew what each other was going to wear. Imagine my surprise when two other scrappers had the same one as me. LOL SO FUN!!! We wore these "bikinis" all day and evening. Some of us even went out to pick up dinner in them. Did I say SO FUN? I think that we spent that first day just taking pictures and laughing about the shirts. I loved mine! LOL This is the only time that I enjoyed wearing a swimsuit. For all of you that are wishing you could have one of these super cool bikini tees you can. We got them at Gadgets and Gizmos . I hope you have enjoyed seeing what Scrap Camp was all about this year. I had a ball. I have to say that it is the AMAZING group of gals that attend that make it the fantastic time that it is. Each one contributes so much to camp and it is the wonderful combination of all *ten of us that make it the blast that it is. Thank you to all of the Scrapping Beach Babes for another fabulous camp! Thank you so much for stopping by! I hope that you have a magical day doing something that you love!!!! * This year one of our campers could not attend. I have to say she was deeply missed!! Looks like you ladies all had a really fabulous time. I did see one Scrap Camp attendee really did have a bikini on - no tee! You look fabulous in your!